Experience rural and urban Cuba through the lyrical images of artist and photographer Susan S. Bank. Bank will present her award winning books, Cuba: Campo Adentro and Piercing the Darkness, followed by a lively conversation with the artist herself, Liz Munsell, Assistant Curator, Contemporary Art & Special Initiatives at Museum of Fine Arts, Boston, and Iaritza Menjivar, artist and documentary photographer, moderated by Anabel Vázquez Rodríguez, Curator at Leica Gallery Boston. Susan S. Bank is based in Philadelphia PA and Portsmouth NH, and was educated at Barnard College and the University of Edinburgh. Bank decided to become a photographer at the ‘perfect point’ of age 60, and for the first decade of the 21st century, she worked on the elusive, mythical island of Cuba, producing two bodies of work. Cuba: Campo Adentro, is an intimate portrait of daily life of tobacco farmers and their families in Pinar del Rio province. 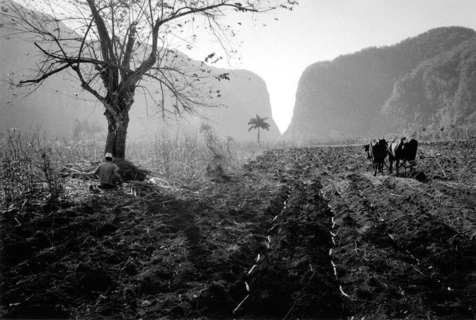 The work was first shown at The Fototeca in Havana Cuba in 2004, The Best Photography Books of the Year by PHotoEspaña 2009 and Best Books of the Year 2009 Photo-eye Books. In addition to exhibitions in several venues in Cuba, a selection from Piercing the Darkness was included in “100 Years of the History of Photography of the City of Havana”, curated by Nelson Ramírez de Arellano, at the 9th Havana Biennale 2006. In 2016, her book Piercing the Darkness received the Lucie Award and and was selected it as one of the 10 best books by Elizabeth Avedon. Bank continues to work with her Leica M6 on long-term projects close to home. “I wait in shifty shadows for the invisible, where the real slips seamlessly into the surreal, where the mask of a smile is always for sale, and Cubans have nothing to give but their soul in a cup of coffee.” – Susan S. Bank. Admission: Complimentary and open to the public. Click here to reserve your spot. The event is held at the Leica Gallery Boston. For more information, visit www.leicagalleryboston.com or follow the gallery on Facebook and Instagram: @LeicaGalleryBoston. Liz Munsell is the Lorraine and Alan Bressler Assistant Curator of Contemporary Art & Special Initiatives at the Museum of Fine Arts (MFA), Boston. Previously, she served as a visiting curator at Harvard University’s David Rockefeller Center for Latin American Studies. A Fulbright Scholar to Chile in 2006, Munsell holds a BA in International Letters and Visual Studies from Tufts University, minor in Latin American Studies, and a Masters in Cultural Studies from the Universidad de Chile. Munsell’s latest exhibitions include Pablo Helguera’s Club Americano at MFA, Boston (2017); Embodied Absence: Chilean Art of the 1970s Now at the Carpenter Center for the Visual Arts, Harvard University, Cambridge, MA (2016-7), and more. Iaritza Menjivar earned her BFA in Photography at Lesley University College of Art and Design. Currently, she is Social Media Marketing Manager Digital Silver Imaging and most recently was assistant to director at the Griffin Museum of Photography. Menjivar’s ongoing project, First Generation, was featured on The New York Times Lensblog. Iaritza is awardee of the St. Botolph Foundation Emerging Artist Grant in the Visual Arts. She was also a scholarship recipient for the Seeing Crete: A Photo Diary Workshop in Crete, Greece, part of Maine Media Workshops in 2015. She has been part of international and national group shows, including being part of the Emergi-Cubes at Photoville 2016 in New York.